"A sharp-witted gloss on the scientific and sexual obsessions of Victorian society. "—TIME"Moore has combined his love of 19th-century adventure literature with an imaginative mastery of its 20th-century corollary, the superhero comic book. "—PUBLISHERS WEEKLY"Swashbuckling, wry humor. "—SPINLondon, 1898. The Victorian Era draws to a close and the twentieth century approaches. It is a time of great change and an age of stagnation, a period of chaste order and ignoble chaos. It is an era in need of champions.In this amazingly imaginative tale, literary figures from throughout time and various bodies of work are brought together to face any and all threats to Britain. 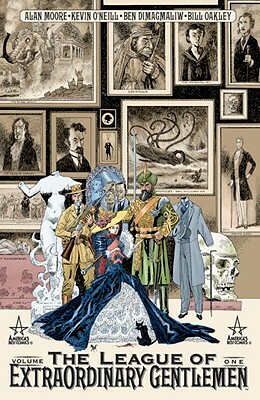 Allan Quatermain, Mina Murray, Captain Nemo, Dr. Henry Jekyll and Edward Hyde and Hawley Griffin, the Invisible Man, form a remarkable legion of intellectual aptitude and physical prowess: The League of Extraordinary Gentlemen.